Once, Isuzu sold a full line of cars and trucks in the United States, winning some acclaim but few sales for its cars, despite clever ad campaigns. Lately, Isuzu has concentrated on pickups and SUVs, finding few buyers for its unconventionally styled utes but doing fairly well with pickup buyers. The Axiom is a large SUV in the Grand Cherokee price class, offering on-demand four wheel drive, an automatic transmission with power and winter modes, and an adjustable suspension. 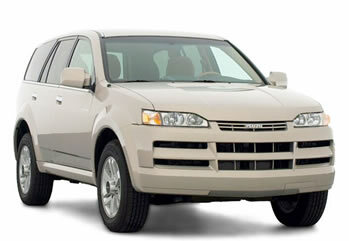 The overall package is different from most other vehicles on the market in both looks and capabilities. Overall, it is larger and more fully featured than most competitors, sporting a far better warranty but inferior ride, handling, and ergonomics. In terms of looks, the external appearance is interesting, at least. The front is aggressive and unusual, the rear less so. Open the door, and the interior is surprisingly inviting. Our XS model had a pleasantly colored light brown interior, with black and chrome accents. The gear shifter had a chrome bar with leather surround and a chrome button for getting out of park or going below third gear. Even the steering wheel was two-toned, with brown and black leather. Overall, the interior was inviting. The controls are interesting, at least. Power lock and window controls are conventional, while the large four wheel drive control knob is placed right where many vehicles put their headlight switch - and is shaped like a headlight switch, as well. Next to it are the cruise on/off and fog lamps, and below it are the mirror and rear wiper-washer controls. Why? Why not? The right hand stalk holds both windshield wiper and cruise controls. There is no single-wipe function, and the cruise control is a bit confusing at first, with twist actions needed to resume or accelerate and to cancel the cruise control. Setting speed is done with a button on the end of the stalk. Pulling the lever, which on some vehicles cancels the cruise, activates the windshield washer. Moving on to other idiosyncratic controls, we find the stereo and climate control in the same console, with stereo buttons in black and climate controls in grey (at night, the climate controls are backlit in a different shade). These take some getting used to, especially since feedback for both the stereo and climate control are in an LED console above the stereo, which also houses the clock, compass, and trip computer. You need to move your eyes from the road to do most functions, down to pressing the mode button repeatedly while watching the LED screen to get the desired vents. Illumination for the LED is controlled by a button which, again, must be pressed repeatedly for the right amount of light (the system sets itself automatically if left alone). Below the stereo are the buttons for automatic transmission mode - power, which downshifts more readily and will be preferable to many drivers - and winter, which starts out in a higher gear to avoid wheelspin. Appropriately, you can leave the power mode on all the time to get better acceleration (at the cost of gas mileage), but the winter mode must be reset each time you start out. The suspension control is next to it, so you can choose whether you want handling to be very sloppy or extremely sloppy. The automatic (thermostat-controlled) climate system works well, though like most, it tends to want the fan on at a very high speed. You can override the fan, mode, or air conditioning compressor easily. The multitude of tiny buttons, though, can pose a problem for drivers who don't just set it and forget it. The instrument panel is clear if sometimes cluttered. The automatic transmission and suspension modes are both indicated on the panel, along with the cruise control status, so there can be a lot to read. The "torque on demand" (automatic four wheel drive) has its own display under the full-size tachometer. There are also a gas and temparature gauge. The unusual art-deco font used for the gauges looks a bit out of place with the modern design. Dual removable cupholders are deep enough to work well with appropriately sized cups, but the shallow areas for putting other things are made of hard plastic that can lead to rattles. The same is true for the center console, which in our vehicle was largely taken up by the CD cartridge. There are map pockets on both front doors, along with a usable glove compartment and a roof-mounted container for sunglasses. There are also dual power outlets, both in the same place, and both keyed to the ignition; and three garage door opener buttons built into the automatic rear-view mirror. Interior lighting includes map lights in front, a dome light in the middle, and a cargo light at the other end. The trip computer always shows the compass in a snazzy 3D-style format, and can be set to show the exact compass heading - a very rare and useful feature. It can also show the more conventional miles per gallon and distance to empty. The same screen has the stereo and climate control status, a clock (with elapsed time counter), the date, and the outside temparature. It's a bit crowded but has lots of useful information. You can shut off all but the clock, climate display, and stereo status with the touch of a button. 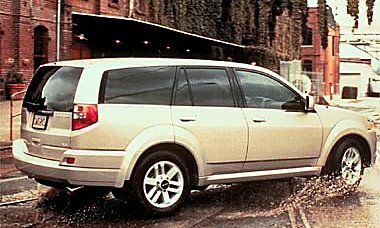 The interior is fairly spacious, not as large as the Suburban, but bigger than a Grand Cherokee or Ford Explorer. The rear seats have a 30/20 split so you can fold down one or two seats at once and have room for long cargo. The cargo area itself is flat, with a useful net and a compartment underneath for the spare tire. Visibility is surprisingly good in all directions, aided by oversized side mirrors. Headlights are strong and fog lights are mounted and aimed appropriately for seeing through fog. The engine is strong, though it prefers the higher reaches of revolutions. Using the power mode provides strong acceleration, including on steep uphill climbs with the air conditioning on, with fast and firm downshifts that keep the engine happy. The standard mode is better on fuel, with generally softer shifts but more time before full power comes. We found gas mileage to be true to EPA estimates of 16 city, 20 highway, which is actually good for this class of vehicle (though low for a minivan of similar size and power). We were able to achieve over 20 by keeping to legal speeds, but aerodynamics will punish speeders, and using the power transmission mode drops gas mileage by about 1 mpg. Wind noise is minor at legal highway speeds. One would think that the handling deficit would be compensated for by a nice, smooth ride, but that is not the case here. The ride is choppy and bouncy. On the lighter side, off-roaders will appreciate the true four wheel drive and standard skid plates. 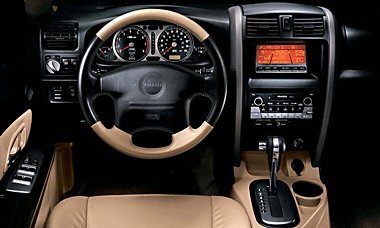 Most drivers will appreciate the standard eight speaker stereo with cassette and CD player, automatic climate control, central information display, and other semi-luxury features. The plastic mat for the cargo area helps to save the carpet from almost certain damage, and includes cutouts for the child seat tether strap anchors. A full size spare tire is included, too. Other handy features include a limited slip differential, four-wheel antilock brakes, tilt-wheel, remote keyless entry and alarm, and rear wiper-washer. Our XS package also had leather heated seats, a four-way power passenger seat, power moonroof with express open and separate vent control, fog lights, and an attractive chrome body side molding package. Overall, the Isuzu Axiom has an interesting appearance and feature set, but is relatively unergonomic and has a poor ride and handling. 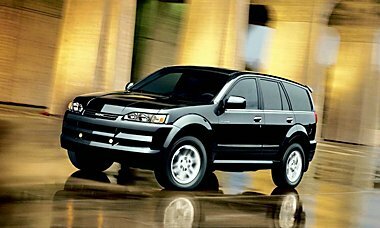 In its favor are a 230 horsepower engine, decent gas mileage, and a comparatively low price of $32,000 for our nicely loaded XS model - far lower than most competitors. Those who don't care about ride and handling may be convinced by the excellent warranty, which as far as we know is the best available: three years or 50,000 miles basic, plus ten year, 120,000 miles on the powertrain. That's hard to beat. I think I am in love with the Axiom. Nicely written I enjoyed reading this post.